Stephen King scares me. I have read only a handful of his books: Christine, The Green Mile, Carrie, but those have left a residue in my brain. My fear, created by the gruesome images in his fiction, would probably please him: he likes to tell stories that unsettle the reader. I have, however, become a fan of his non-fiction book On Writing. While I am not as rabid as Annie Wilkes of Misery, I push this book on as many readers as possible. When I mention King’s name, however, I recognize the same uncomfortable flicker in their eyes. King scares them. On the surface, On Writing: A Memoir of the Craft is King’s memoir mixed with writing tips. The book is divided into three parts; the second part has two subsets of witty literary criticism. In section one, the reader learns about King’s childhood, the history of his writing career, and the inspiration for several stories. He discusses his addictions, his stories, and his marriage to Tabitha, an author and his chief literary critic. In the second section, King discusses the craft of writing, first through the use of a “toolbox” of grammar and then with application of these tips in various works of literature. The third and final section of the book covers his near death experience in June of 1999 when he was hit by a motorist on a side road in Maine. We assign this book to our juniors who are taking the Advanced Placement English Language class, a course in familiarizing students with rhetoric and argument. The critical commentaries he offers in his “toolbox” section are especially helpful in helping students develop a style of writing. I have had some success in locating used copies of the book in its various editions. There are hardcovers and paperbacks in the secondary markets of thrift stores and library book sales, but I need to look close at the book spines since they are different in size and appearance. Our class set is a mish-mash of all editions. The most frequent edition’s cover art is a picture of the cellar door, and if there was a book cover design that was dead wrong for the contents, this cover gets my vote. The cellar door may mean entrance to the “foundation” of writing, but the cream colored clapboards, bright window, and potted plant are an odd chice for King. The cover art with the letters of rejection nailed to a wall is macabre, perhaps a better choice for King and the contents. 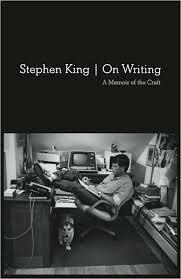 My favorite cover, though, is the most recent and centers on a photo of King working at his desk. The macabre cover with rejection letters nailed to the wall; blood red title. “If you want to be a writer, you must do two things above all others: read a lot and write a lot. “But how do you know when you are using passive voice?” my students ask. I offer my new “tool” to test, a tool I found on a Facebook post. “If you can put ‘by Zombies’ after the verb, then you have passive voice,” I respond. Passive voice and Zombies? I think Stephen King would enjoy that discussion. I’m a big fan of this book too. No matter what he’s writing, Stephen King knows how to make his words and images stick with readers. Great review here, Colette. Thanks! Love the “by Zombies” rule! 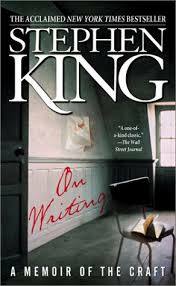 If I could only have one book on writing it would be “On Writing.” Even though I am a big reader, advocate, proponent of literary fiction, and study medieval text at university, I never apologize for reading King. Although, the few books of his you mention are not on my favorite list of his works. I like “The Stand,” “The Dead Zone,” “The Talisman” “It,” and his latest about the Kennedy assassination. He is simply a great story teller and does not pretend to be anything else, but he has insight into the human condition too. 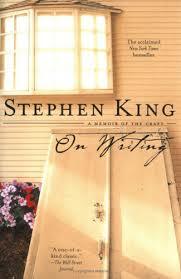 I will revisit King; On Writing has made me more appreciative. I hear many good things about 11/23/63, so I will try that soon. Thank you for recommending. Excellent post! I’ll definitely have to pick this one up for my ELA classes next year (and for my own benefit)! I like passive voice and adverbs. No linguistic demagogue will ever be able to dissuade me from using those a lot in my fiction, no god, no King, no tribune!